Objectives To study socioeconomic inequalities in mental health in rural and urban Colombia, a country with a history of internal conflict and large socioeconomic inequalities. Recent survey data are available to study this understudied topic in a middle-income country. 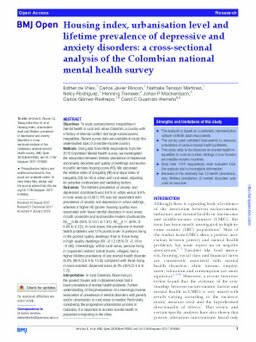 Methods Using data from 9656 respondents from the 2015 Colombian Mental Health survey, we investigated the association between lifetime prevalence of depressive and anxiety disorders and quality of dwellings and access to public services housing score (HS). We calculated the relative index of inequality (RII) and slope index of inequality (SII) for HS in urban and rural areas, adjusting for potential confounders and mediating factors. Outcomes The lifetime prevalence of anxiety and depression (combined) was 9.6% in urban versus 6.9% in rural areas (p<0.001). HS was not associated with prevalence of anxiety and depression in urban settings, whereas a higher HS (poorer housing quality) was associated with fewer mental disorders in rural areas in both univariate and multivariate models (multivariate RII urban 0.96 (95% CI 0.51 to 1.81); RII rural 0.11 (95% CI 0.04 to 0.32)). In rural areas, the prevalence of mental health problems was 12% points lower in persons living in the poorest quality dwellings than in those living in high-quality dwellings (SII â -0.12 (95% CI â -0.18 to â -0.06)). Interestingly, within rural areas, persons living in â € populated centres' (small towns, villages) had a higher lifetime prevalence of any mental health disorder (9.8% (95% CI 6.9 to 13.6)) compared with those living in more isolated, dispersed areas (6.0% (95% CI 4.6 to 7.7)). Interpretation In rural Colombia, those living in the poorest houses and in dispersed areas had a lower prevalence of mental health problems. Further understanding of this phenomenon of a seemingly inverse association of prevalence of mental disorders with poverty and/or urbanisation in rural areas is needed. Particularly, considering the progressive urbanisation process in Colombia, it is important to monitor mental health in populations migrating to the cities.